The Pig and Snake compatibility is very poor when it comes to love, friendship or business. The Chinese astrology Pig sign is intensely passionate and easily distracted by finery and the quest to bring happiness to everyone. The Snake, while equally able to appreciate the decadent things in life, is much more likely to use sensuality for the purpose of seduction. It isn’t that the Snake is looking for a lover or sexual partner in everyone they meet. Rather, the Chinese zodiac sign Snake suffers from an inner insecurity that leads them to validate themselves through the adoration of others. A Pig and Snake friendship is perhaps more exciting, and more dangerous, than even a Pig-Pig match. The loyalty of Pig is unquestionable, but they are also mysterious by nature. When the pig is dating a snake, their love compatibility might be bad, thus leading to a breakup. The Snake sign tends to be insecure and this mystery can and will cause jealousy. A casual relationship may not be possible between these two Chinese horoscope signs, as it is entirely possible for the two to fall into an inward spiral of hedonism and decadence that excludes the outside world entirely. This mutual orbit is inherently unstable, however, as the Pig and Snake soulmates operate quite differently. With hard work and effort a relationship can be made viable. Do not ever fail to underestimate the amount of work that will be required. Despite liking many of the same things and sharing many of the same interests, the Pig tends to operate on a logical and intellectual level while the Snake tends to operate almost purely on intuition. Misunderstandings will be frequent and must be recognized and dealt with immediately in a pig man snake woman marriage! When they feel crossed or slighted, they are both equally capable of malicious retribution. This may sound like an awful lot of gloom and doom; a dire warning to avoid this situation at all costs. If you’ve made it this far, perhaps you have the particular mix of perseverance and romanticism required to make a real go of it. When a Snake man and Pig woman in love can work out their mutual differences, their combination of intuition and logic make them an extremely capable duo. They are then able to handle any obstacle and stumbling block that wanders into their path. Sexually, the male Pig and female Snake should be the most careful. On the one hand, it may just be safer for everyone involved to just back away slowly with hands raised and look elsewhere for companionship. On the other end, the native passion of both these Chinese astrology signs is such that it will inevitably be as memorable as it is short-lived. It is entirely possible to make this Pig and Snake relationship in bed work, but caution and communication must be exercised at all times. There will be ups and downs, hot and cold streaks. Be undaunted and steadfast. To an outsider, it may seem that the bedroom spawns drama and intrigue beyond belief. Those who do not live and love in passion unbridled are incapable of understanding the allure. Chinese astrology compatibility predicts that business is is yet another venue in which the point cannot be elaborated enough. It will require an immense and ongoing effort on the part of both the Pig and Snake to keep from offending one other. However, once again, this is an area where, when those differences are exploited for mutual benefit, the duo can be incredibly successful at whatever they put their collective effort toward. Rather than crushing competition, the Snake and Pig match will do best when acting on their own innate impulses. The Chinese Pig can bring to bear immense power of persuasion, turning enemies and obstacles into ardent supporters, while the Snake uses intuition and appeal to be a natural diplomat. 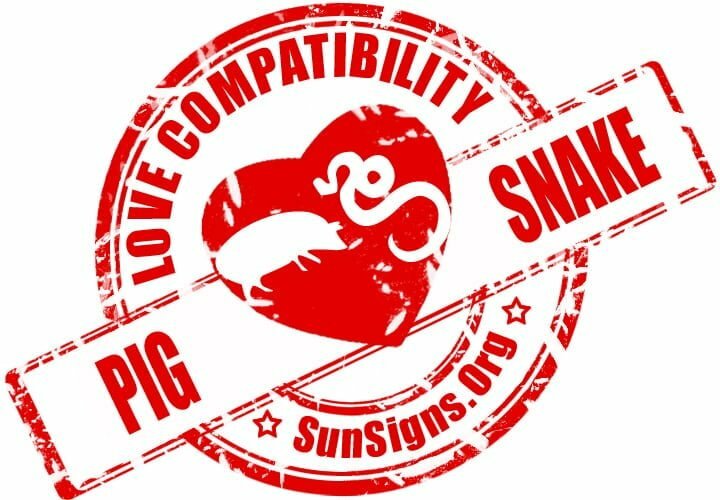 Pig & Snake Chinese Horoscope Compatibility Rated 1 Hearts!